Not my headline - as you can see! This comes from the Washington Post of 1920 - it seems the 'middle-aged dancers' had taken over the dance floor - now that would never do! Seems the men had to be told where to put their hands! and whatever happened to the schottische? in fact what is it? London, Aug 28. 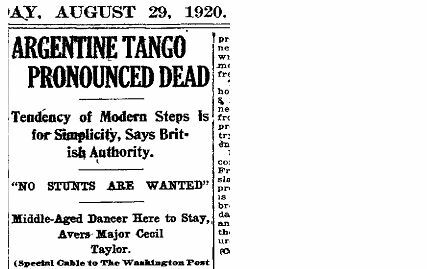 — The Argentine tango, which has been dying since 1914, got its last jolt today, when Maj. Cecil Taylor, president of the Imperial Society of Dance Teachers Congress, pronounced it dead. Fashionable dances next season will be a new and thoroughly reconstructed tango, the fox-trot, the one-step l’Italienne and the Spanish schottische. Simplicity in movement is the basis of these dances. The ‘hip hold’ is barred. I love it! Thanks for posting. It seems to be doing rather well for something that has been dead for 90 years! The winners in the salon category of the tango world cup last night were just 18 years old. Who are they Mark? I haven't been able to find any information on who they are, how the competition went, what the other competitors were like... anything?? If I can scrounge a ticket for tonight's final of the stage category I'll post a report on that too. Los segundos son : Cristian Correa & Manuela Rossi de Buenos Aires, Argentina. Los terceros son : Cristina Andres Lopez & Naoko Tsutsumizaki de Tokyo, Japon. Los cuartos son : Leonardo Luizaga & Paola Giselle Luizaga de Zarate, Argentina. Los quintos son : Eber Alejandro burger & Yesica Lorena Elias de Lanus, Argentina.